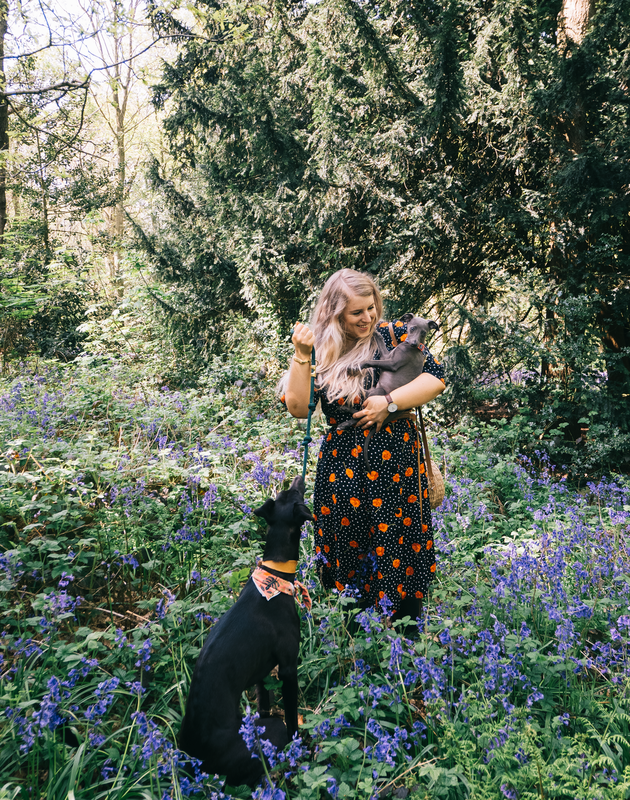 This is not the post that I originally wanted to write to accompany these lovely photographs from a morning at the bluebell woods. But on the day I came to writing the original idea I had a terrible day, nothing bad really happened but it was just one of those days. And we all have those days but we never, ever seem to like to admit to having them. I can't say I like to do that either but something I've come to realise is that they're actually kinda important and here is why. Everyone, absolutely everyone has bad days. It doesn't matter who you are, what you do or how much money you have and they're completely normal and just part of life. It's just like when we don't feel quite our best, it's as normal as feeling happy but for some reason when it comes to negative emotions we want to bat them away and act like they don't exist which can be really dangerous as I truly believe we need to feel all sorts of emotions to feel balanced. Of course, I'm not talking about negative emotions that are related to mental health issues, that's a whole different conversation. But just regular bad days and moods are completely normal and need to be spoken about more. Way more often than not when I have a bad day it's not usually because of some huge life changing reason. Of course, there are days like that and when there is a reason behind a bad day it almost makes it easier to handle. Because when there is no exact reason it's so frustrating as we can't work through it by tackling the root of it. I'm sure I'm not alone with saying that sometimes I wake up and as soon as my brain has got into gear I know I'm in a bad mood and no matter how hard I try to get myself out of it nothing works. There is a reason why the saying 'got out of bed on the wrong side' exists. And typically these days don't last long, sometimes it's not even an entire day and it doesn't make sense but it happens to the best of us. Whining and wallowing for days is not something I can allow myself to do as I tend to fall into a pit of despair where I hate everything and tend to be pretty miserable to be around. So I try and set myself a day or so to vent about things that might not be going exactly how I'd hoped and let myself moan to get it out of my system and then move on. Whenever we hear or see people being negative online or even in real life we then tend to presume that's how they are all the time and it's rarely the case. Giving people the room to get it out of their system and out of their mind is so important. Although it sounds really cliche and quite frankly irritating when everything goes well, I can't say I'm always as grateful as I should be and a lot of the time it makes me feel complacent. Of course, this post isn't about the huge life-changing things that occur that are truly heartbreaking. It's more about the little irritating things that happen and in the long run, do no matter an ounce but can still be upsetting and difficult to deal with when it happens but ultimately we move on. I know when these things pop up which can sometimes be annoyingly often I'm always way more appreciative when things do go as I'd hoped then if everything is always awesome. We can't always have things go our way and social media can often be the biggest comparison trap for that as no-one ever shares when things that haven't gone well. Scrolling through your feed you're always bound to find a tweet saying 'lots of exciting things happening' rather than seeing something along the lines of 'my inbox is dead, I'm panicking'. So you've had the bad day, you've wallowed on the sofa and sent your best friend a million and one crying emojis whilst scrolling through your various social media feeds. And when we've stopped feeling sorry for ourselves something brilliant always happens and it gives us a good push to get things done. As someone who is self-employed these bad days have a serious knock-on effect on my work day as I only have myself to tell me to get things done, I'm completely responsible for myself which isn't always a good thing. When the bad mood mist finally clears, usually in an evening it always makes me want to get things done. Which is why I think a bad mood can be a good thing as sometimes we need that extra push that we might not have had to get off the sofa, take off our dressing gown and get that to-do list ticked off. Loud music, I always play Paramore After Laughter. Sitting down and writing a plan of action. A bath or a night to do your favourite beauty rituals. Washing my hair, no idea why or how this always works but it does. how do you get yourself out of a bad mood? do you think they're important?